This famous clan surname is Irish. The twelth most numerous name in Ireland, it originates from Raghailligh, the grandson of Conchobhar, king of Connacht in the 10th century, and founder of the clan O'Connor. As such the O'Reillys are kinsmen of the O'Connor's. Traditionally, Irish family names are taken from the heads of tribes or as in this case from some illustrious warrior. They are usually prefixed by O' meaning grandson or male descendant of, or Mac denoting "son of". The O'Reilly territory was around Lough Oughter in County Cavan and as they increased their strength, they extended their territory to County Westmeath and Longford. The Franciscan Abbey of Cavan was founded by Giolla Iosa O'Reilly, and over the centuries there have been no less than thirty nine O'Reilly abbots, whilst five have been as Archbishops of Armagh, primates of All Ireland. The celebrated Count Alexander O'Reilly from County Meath distinguished himself first in the Austrian service and then in the Spanish army, and finally as Governor of the French colony of Louisiana where he died in 1797. The O'Reillys have a reputation as astute financiers. 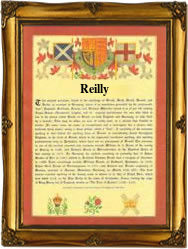 In the 15th Century, they devised their own coinage, and a "Reilly" came to signify a coin of useful value. The Coat of Arms most associated with the family is a green shield with two gold lions rampant combatant, supporting a dexter hand couped at the wrist erect and apaumee bloody proper. The first recorded spelling of the family name is shown to be that of Cathal O'Reilly, Prince of Breffny, which was dated 1237, in the records of Lough Oughter Monastery, County Cavan.